195 DAYS TO GO. . .
For many women, the second trimester of their pregnancy marks the disappearance of many of the discomforts of pregnancy. The high levels of pregnancy hormones are subsiding and fatigue should begin to diminish starting around week 13 of your pregnancy. The Eyes are still sealed and have moved forward to the front of the face. 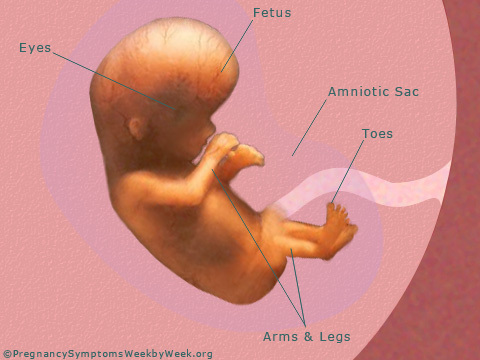 The Amniotic Sac contains fluid that absorbs movements of your active fetus from you noticing. The Toes are now fully separate and about the same length. The Arms & Legs muscles are developing as they lengthen rapidly. 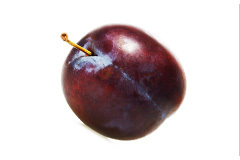 Your baby is about the size of a plum during week 13. Now that you are settled into your pregnancy, you may want to start telling more people in your life about your baby. Besides, your belly will start to show in a few weeks, and people will start guessing for themselves! Be prepared for an onslaught of advice and people’s tales of their own pregnancies. Don’t let them scare you! Everyone’s experience is unique and individual. This is the time in your pregnancy when tests for abnormalities in your baby may take place. Your doctor may require diagnostic tests of the amniotic fluid to rule out abnormalities such as Downs Syndrome. These tests will give definite answers in about 1-2 weeks, as chromosomal analysis tends to take this long to be accurate. 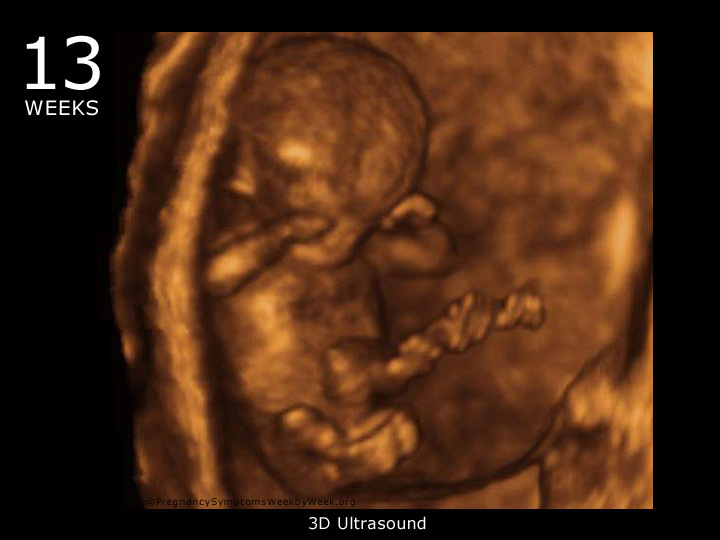 During this time, your uterus is also expanding to allow your baby more room to grow and stretch. You may begin to notice a few twinges around your pelvis as this occurs. You will soon adapt and find sitting and lying positions that cause you the least discomfort and which may relieve discomfort. Also try conventional methods of pain relief such as taking a warm bath or lying comfortably with your feet up. This pain is common in pregnancy and is not a cause for concern. Your baby’s brain is developing. Complex brain development is gradually enabling your baby to become more responsive and mobile. The right and left cerebral hemispheres begin to connect. Each hemisphere controls the opposite side of the body, so the right side of the brain controls muscles on the left side of the body and the left side controls muscles on the right side of the body. At this point you will not be able to feel you baby moving inside you, but it is still possible to interact and bond with your baby. Bond in a way that feels natural to you. Soon your baby will be able to hear and recognize your voice and that of your partner as well as hear music. Your baby is also developing reflexes. Your baby may squirm if your abdomen is pressed.